"Less is More": Happy 5th Birthday "Less is More"
Happy 5th Birthday "Less is More"
"I'm thrilled to be back supporting my favourite challenge's 5th Birthday. 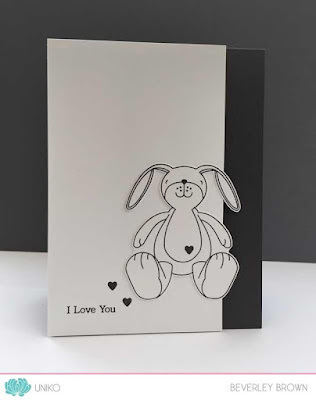 For my card I've just used the simplicity of die cuts. The two heart frames are by Concord and 9th and layer over each other with foam tape. I added a gold foiled "love" from a Wplus9 die and finished with some tiny matching gold gems." Bev is sharing a sneak peak of a new Uniko set! 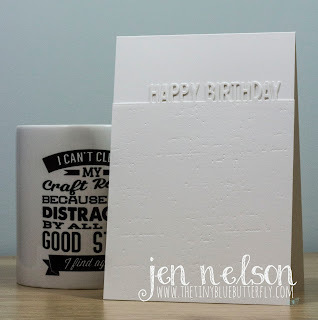 White on white using Butterfly Birthday (stamp and die) and Fun Birthday Sentiments! We are delighted to be joined by our former designer for this special week! A simple White on White card using an edge die from Impression Obsession. I cut out two layers and then embossed one of them using the Papertrey Ink Linen Embossing plate for some texture. And the fabulous mug in the background, I have a spare one you can win if you pop over to my blog and leave a comment on the post as a special birthday giveaway. Apart from the embossed background, everything here is by Clearly Besotted. 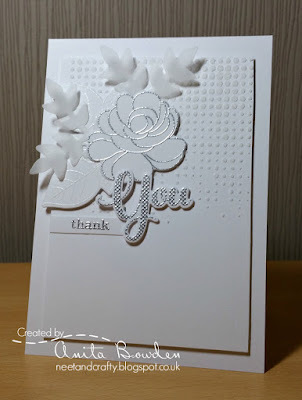 I stamped the flower (Love Quotes II), the 'you' and 'thank' (Thank You set) in Versamark and heat embossed in silver and cut these out with their coordinating dies, and the 'thank' onto a strip of white cardstock. The leaves were stamped and heat embossed in white and also cut with the coordinating dies, and the smaller leaves (Leafy Accents) were die cut from white vellum. 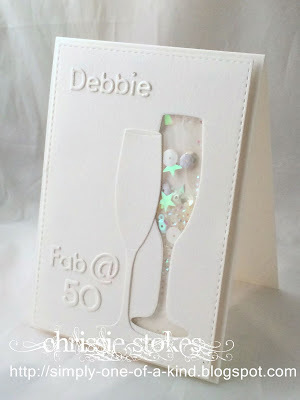 For the main panel I used some white embossing paste through a stencil, Dot Fade by Tim Holtz. I then layered these up, adhered to the panel and then popped it up on 3D foam. The whole card is made from linen textured card. The flowery heart is a Memory Box Serafina die, attached to a XCut heart that was run through a Sheena Douglass embossing folder. 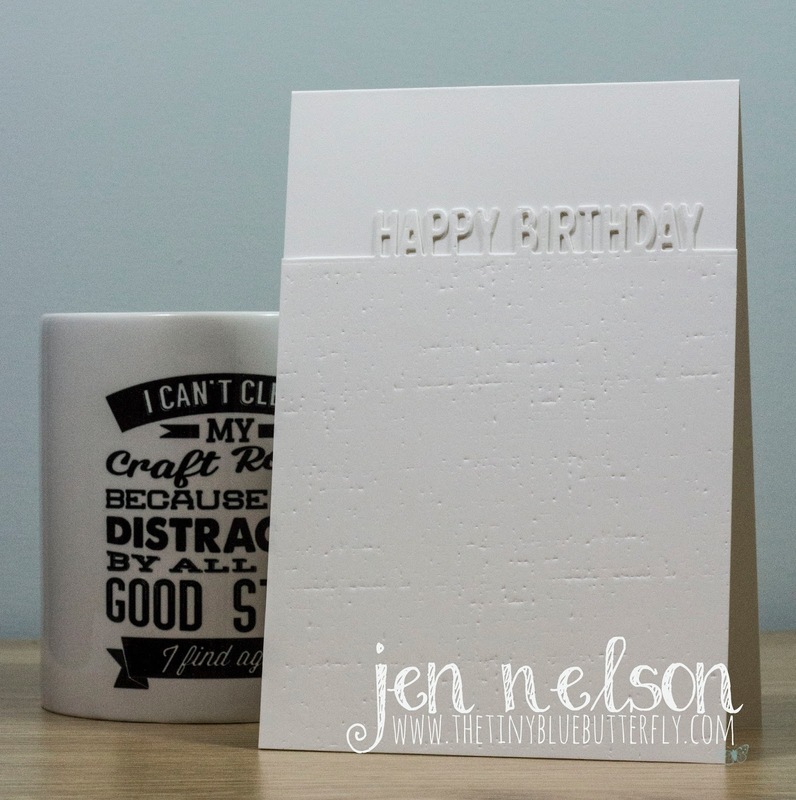 I embossed the Clarity sentiment and added a small XCut heart to it. Here is a die-cut shaker card, using MFT's champagne glass and letters from Memory Box Alphabet Soup, with the @ from Cuttlebug. Being on the Design Team there I've been given the nod to treat you to a card using one of the brand new sets which hasn't even been revealed yet! So let me introduce 'I Love Tea' and being a birthday month my inspiration came from the very English tradition of Afternoon Tea, with delicate china cups edged with gold ... I think my Grandma used to have some very similar to this too! The image and sentiment plus 2 edges of my card base are heat embossed in Gold Sparkle EP and to finish a few gems and pearls from my stash! As always we would urge you to visit the DT at their personal blogs where there is always additional inspiration for your delectation! It would be great if you could visit our Guest designers too! Wow, an amazing collection of inspiring cards, simply fabulous! Congratulations on your 5th birthday ... Here's to the next 5! Happy 5th Birthday 'Simply Less is More'. Some stunning 'white on white' cards from the design team, friends and sponsors. An amazing challenge blog and although I hav'nt entered in ages it is always the first thing I look up on Saturday mornings. I feel inspired to do something different every week. Maybe I will have to take the plunge and enter again. I really enjoyed your singing Linda, thanks so much! Have a colourfull (or white?) weekend! Happy 5th anniversary! I'm finding WoW a real challenge but you all rocked it. Fabulous inspiration! Happy 5th Birthday to the best challenge in blogland! Thanks for having me guest. WOW!! HAPPY, HAPPY 5TH.BIRTHDAY TO THIS AMAZING CHALLENGE BLOG!!! I'VE ONLY BEEN PARTICIPATING FOR A SHORT TIME SINCE I DISCOVERED IT AND I LOVE IT!!! I WANT TO THANK YOU FOR THE SWEET AND ENCOURAGING COMMENTS YOU ALWAYS LEAVE ON MY BLOG AND FOR THE CHANCE TO PUT OUR CREATIVITY TO WORK WITH YOUR IDEAS AND DESIGNS. WISHING FOR YOU MANY, MANY MORE YEARS OF FANTASTIC CHALLENGES. happy 5th birthday! All the inspiration cards are beautiful, congrats ladies! Soooo fun to watch you each month doing amazing creations. You all are always an inspiration to me and to so many others all over the world. Pretty amazing and exciting! These white on white projects are INCREDIBLY BEAUTIFUL and AMAZINGLY INSPIRING. Thanks bunches for always giving us the MORE and MORE of the BEST. j.
WOW where have those years gone, CONGRATULATIONS for a wonderful challenge to see really beautiful cards. LIM is always the first challenge blog I check every Saturday. There's always wonderful inspiration and talented Limettes entering. I have steadily grown in my own abilities of keeping it simple yet making a statement. CONGRATS! I am hoping for at least another Grand Five Years. Huge congratulations! Here's to the next five years! Wonderful samples (as always) and an awesome theme too! Congratulations on your fifth birthday. I always find thereally nice and always happy to do your challenges. I hope we can enjoy for a long time of your challenges. Happy fifth Birthday! Thanks for your fantastic Sample cards. Congrats on a wonderful milestone! May you (and we) have many more to come! Thanks for all the work you put into keeping all the inspiration flowing. I have been away from my blog for....oh um about 3 years!! But the entire time I have had the link to your challenges pop up in my e mails and I have loved seeing the weekly winners and all the DT inspiration....always amazing! Happy Birthday to one of my favourite challenges! Happy BIRTHDAY and thank you LIM! As always awesome inspiration cards! Happy 5th Birthday at LIM Chrissie - what an amazing achievement. Thank you for the wonderful inspiration week after week, and HUGE thanks to you and your Teamies for all you do! Congratulations for challenging us for 5 years.I've learnt so much here. Your cards are always amazing and this week is no exception. Five years is quite an accomplishment! As blog manager at CAS Colours & Sketches for the past year, I know how much time, effort, and creativity goes into making a challenge blog successful - and you ladies have done such a splendid job of it here at Less is More. Congratulations to you all, and best wishes for the next five years! :) I'm sorry I wasn't able to make the time to play along this week. Five years - wow! I was too late to link up this week but wanted to stop by and wish you a very happy birthday - here's to the next 5! You ladies do an amazing job and your creativity is inspiring! Welcome to our new DT members! Week 263 One Layer and DT CALL!